You deserve a smile you're truly proud to show off – and at Henseler & Kocian Orthodontics, our mission is to help you achieve just that. As a leading orthodontic practice with two dedicated offices in Stillwater & Woodbury, we're proud to provide treatments like Invisalign and clear braces to patients of all ages. Our doctors and dedicated team of orthodontic specialists work with patients to create comprehensive, customized treatment plans – many of our adult patients are seeing the incredible benefits of orthodontic treatment! You may think orthodontics is something that's just for kids, but that couldn't be further from the truth. Adults everywhere are discovering the profound change orthodontic treatment can have on their health, self-esteem and overall well-being. No matter what stage of life you're in, orthodontic treatment is a convenient way to revitalize your life by reimagining your smile. Social Situations Get Easier: With a smile you're proud to show off, everything from block parties to after-work hangouts are easier to navigate. Improved Confidence at Work: A better smile provides confidence in presentations, meetings, and day-to-day office life. Revitalized Romantic Life: A new smile improves your overall appearance as well as your confidence, giving a boost to your romantic life. After all, a smile is the first thing people notice. A Healthier Mouth: Straighter teeth are easier to keep clean, helping to prevent tooth decay for decades to come. Furthermore, oral health has been found to have a direct link with other health issues like heart disease. Orthodontic treatment has come a long way in recent years, and there are now a variety of treatment options available to our orthodontists in Woodbury and Stillwater. In addition to traditional metal braces, which are lighter and more attractive than ever before, we offer a number of other orthodontic treatment options for our adult patients that are more aesthetically pleasing, yet still provide effective and efficient treatments. 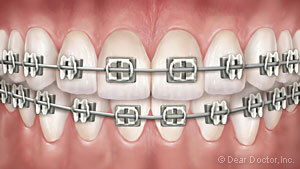 Traditional Metal Braces: This is what most people picture when they think of braces. Made from high-grade stainless steel, traditional braces use brackets mounted to the front of teeth and a thin, springy metal archwire to align the teeth. Modern braces are thinner, more comfortable, and more aesthetically-appealing than ever, providing a convenient, reliable option for orthodontic care. Clear Braces: Clear braces use the same fundamental treatment mechanism as traditional braces, but instead of stainless steel, the brackets are made from a translucent composite material. This means they blend in with teeth, offering a more discreet treatment method that's equally reliable. 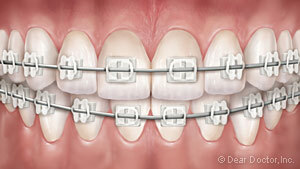 Invisalign: Another option for adult orthodontic treatment is Invisalign clear aligners. Invisalign does away with brackets and wires entirely. 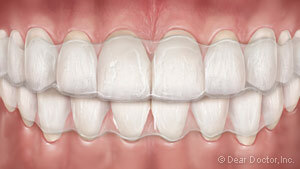 Instead, treatment is comprised of a series of clear, removable aligners to straighten teeth. Invisalign aligners are almost invisible when worn and can be popped in and out to eat, drink, brush, or floss – making them an incredibly convenient option for busy adults. After you finish the active phase of your treatment, it's important to maintain your new smile through the use of a retainer. While your teeth will be in new positions after treatment, the underlying bones and ligaments that support them won't be adjusted to the new alignment – so without a retainer, your teeth can drift back to their old positions! After we remove your braces, we'll fit you for a retainer and provide detailed instructions on wearing it and caring for your new smile. With the diligent use of your retainer, your new smile will last you a lifetime! Orthodontic treatment can revitalize your life at any age – and if you're ready to take the first step towards a new smile, we would love to help. Contact us with any questions you may have or use our easy online form to schedule your consultation. We look forward to helping you achieve a gorgeous new smile through a convenient, personalized orthodontic treatment plan!